Make sure the water supply is off to the shower. If you are only replacing the shower head, and plan to keep the shower arm, wrap a cloth around the arm to protect it from scratches. 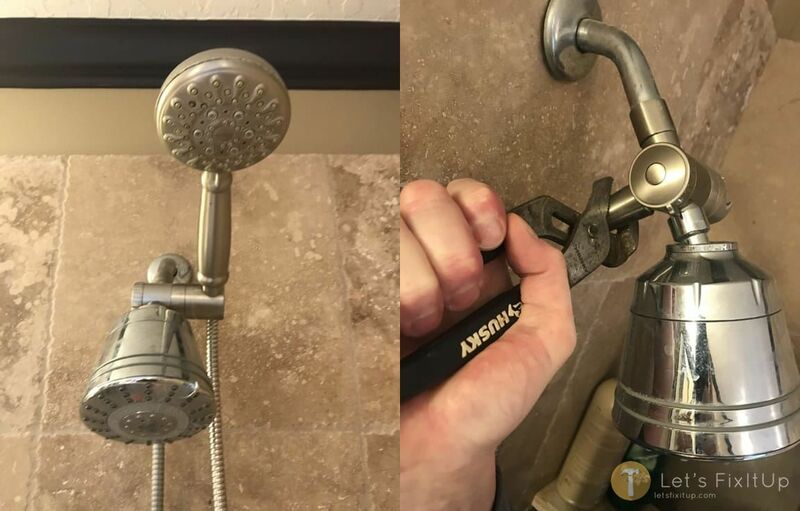 Fasten your pliers/channel lock pliers onto the shower head base where it meets the shower arm and turn the nut counterclockwise. In this example, we are replacing the fastening hose in its entirety, therefore, it is not necessary to protect the fastening hose nut as it will be discarded. 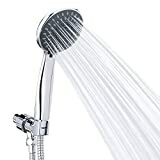 In the event you want to replace the shower arm, unscrew the pipe where it extends into the wall, turn counterclockwise. 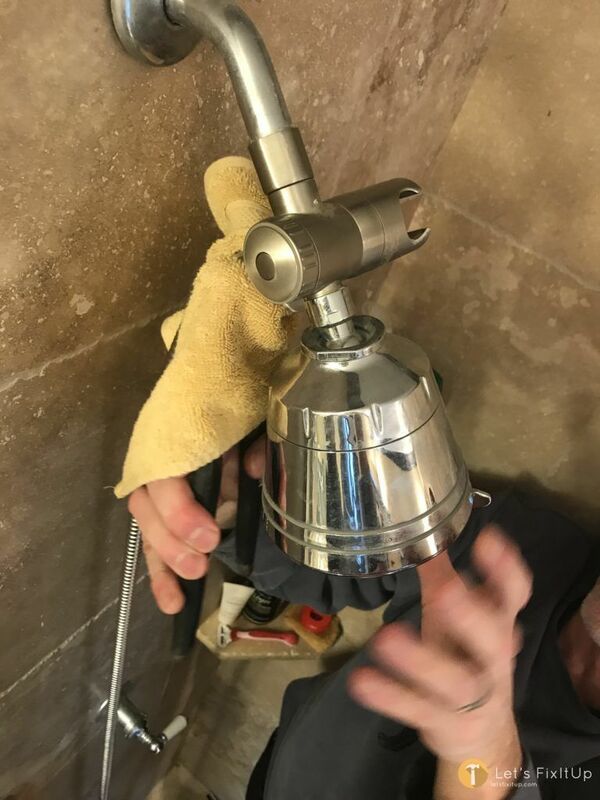 If you are unable to loosen the the shower head or the extension arm, soak a cloth in CRL solution or white vinegar then wrap it around the nut on the shower head, let it soak for several minutes, this will dissolve any mineral build-up and make it much easier to unscrew. Wipe around the hole in the wall to remove grime and mineral deposits. Wrap 3-4 layers of plumber’s tape clockwise around the end of the shower arm that goes into the wall. It’s critical to wrap the plumbers tape in the opposite direction of the threading of the arm as it twists into position. Wrap Plumbers Tape counterclockwise around the male threads of both the extension arm as well as the shower head. Wrap it 3-4 times tightly wound. Insert the end of shower arm into the pipe contained within the wall, turning clockwise. 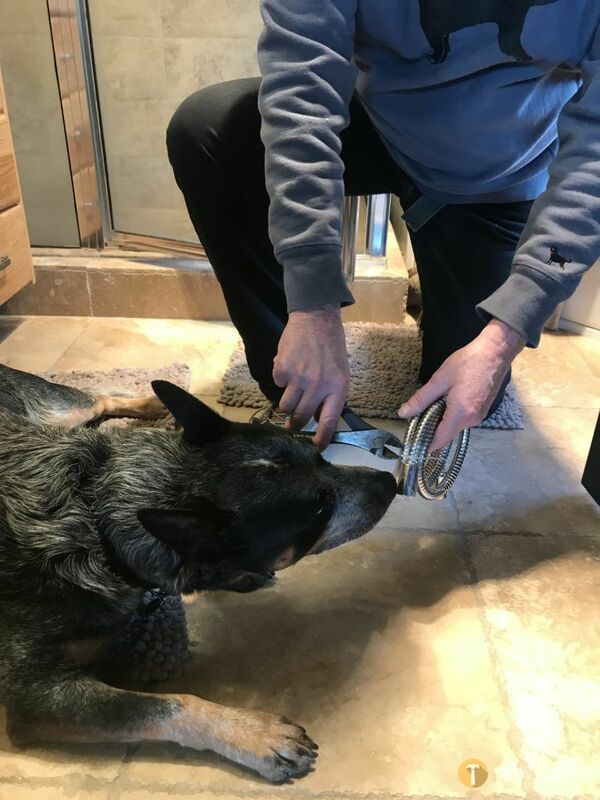 At first just hand tighten, then placing a cloth over the arm and using a pair of channel lock pliers, gently continue to turn about 1/2 revolution. Do not over tighten as this could result in breakage. Replace the o-ring flange. 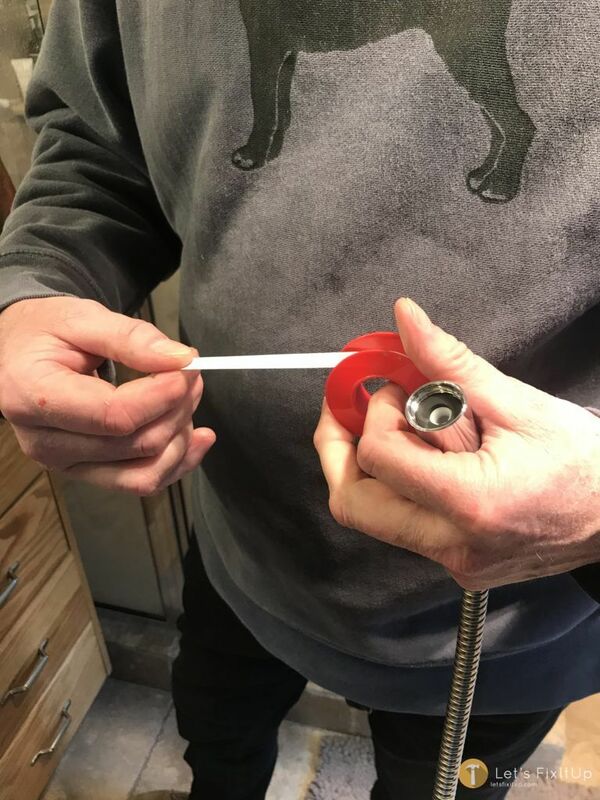 Repeating the process by wrapping, 3-4 revolutions of plumbers tape counterclockwise on the other end of the extension arm. Screw the shower head hose onto the threads by hand initially. 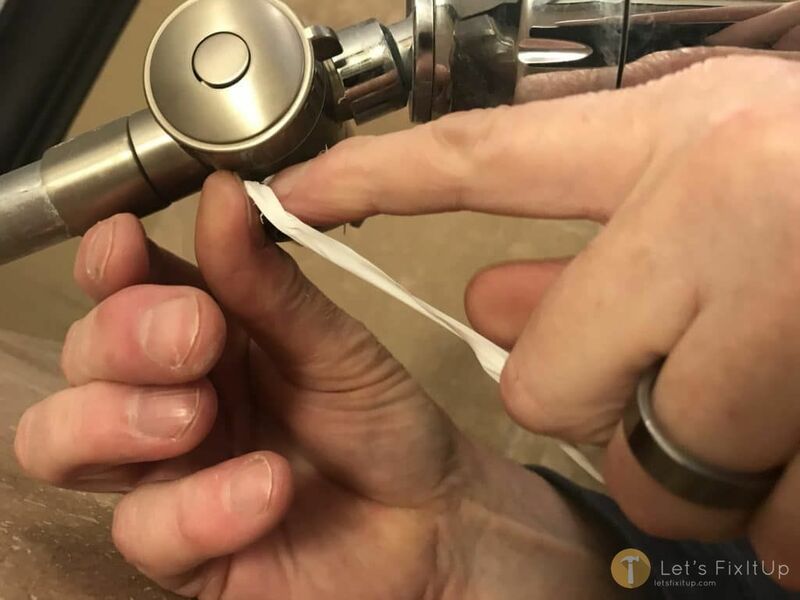 Then cover the shower head hose nut with a cloth , using channel lock pliers continue to turn clockwise about 1/2 turn, this will ensure that the shower head does not leak. 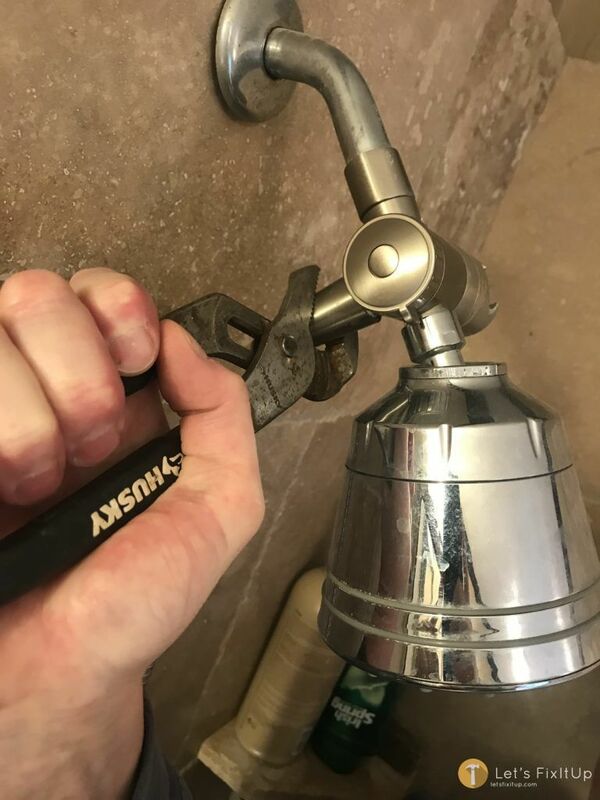 【Easy Installation】Installs handheld Adjustable shower heads with hose in minutes for the bathroom, without plumbers or tools. It fits any standard shower arm. 【Multifunction Design】Luxury hand held shower heads with hose have five different functions and angle-Adjustable brass swivel ball bracket, let you and your family enjoy the relaxing shower experience. 【Advanced Material】High quality ABS plastic material, elegant chrome plated surface and self-cleaning medical TPE nozzles make high pressure handheld shower head lightweight, durable, lead-free non-toxic, to ensure your shower safe and comfortable. 【Extensive Use】The handheld showerheads for the bathroom are suitable for bathing young kids or washing pets, etc. 【Lifetime Warranty】If you have any dissatisfaction about our handheld showers, welcome feel free to contact us via Amazon. Before buying, please confirm that you buy handheld shower from 'Ai-Beauty' store, we can't guarantee the quality if you buy it from other seller! Jessie is a skilled craftsman & DIY expert – with years of general contracting and real estate development experience, Jessie founded LetsFixItUp.com as an authoritative resource for home renovation, design and DIY projects. LETSFIXITUP.COM	Powered by WordPress and Donovan.